Tata Motors is gearing up to launch the Harrier today. The launch event will be streamed live on this website. The link will go live 10 minutes before launch, which is scheduled to start at 12pm. The Tata Harrier is expected to be offered in four variants - XE, XM, XT and XZ. It is likely to get features like projector headlamps with LED DRLs, electric ORVMs, dual-tone interiors with an 8.8-inch touchscreen infotainment system with a JBL sound system. Dual airbags, ABS with EBD and rear parking sensors are likely to be offered as standard across all variants. 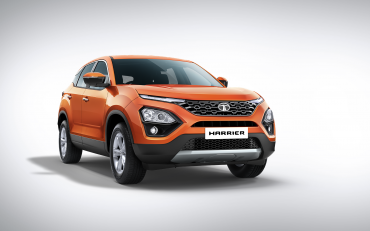 The Harrier will be powered by a 2.0-litre, 4-cylinder diesel engine that produces 138 BHP @ 3,750 rpm and 350 Nm of torque @ 1,750-2,500 rpm and comes paired with a 6-speed manual transmission. It will have three driving modes - Eco, City and Sport, while higher variants will get three terrain response modes - Normal, Rough and Wet.